Note: To see a full-size high-resolution version of a particular photograph click on the photograph. 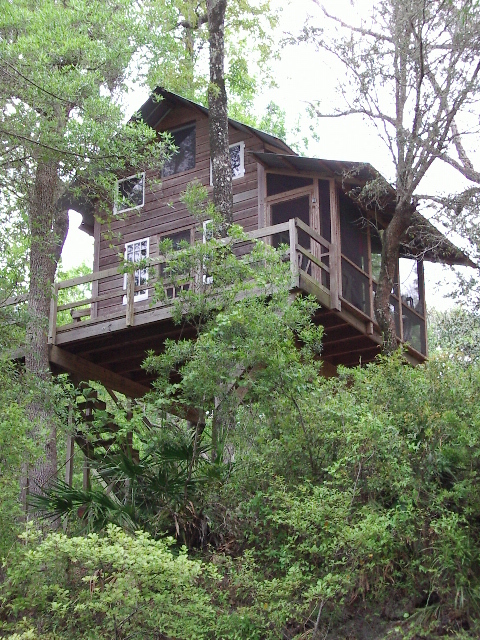 I have a treehouse in north Florida. It sits on the steep banks of the Sopchoppy River (Sopchoppy means crooked river in the native American language, Creek). It rests aloft on three trees and one post about twenty feet off the ground. 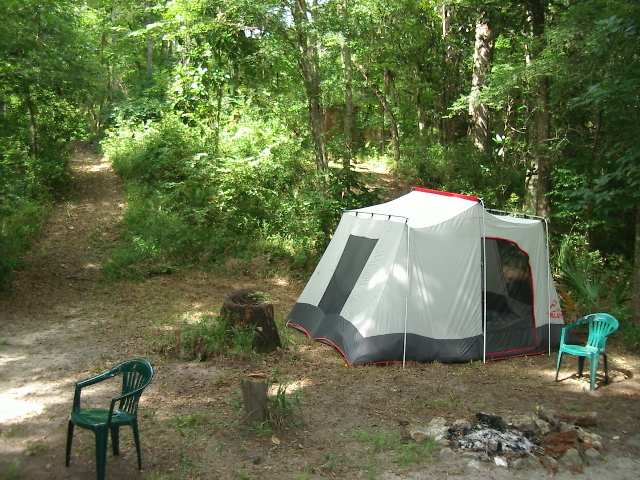 Below the treehouse there is a brick paved open-air kitchen with a camp stove and a picnic table. From the kitchen there are stairs leading down the bank to a dock and the river where I swim. The water there is silky and the color of strong tea, making submerged skin look a rosy amber. The water, though tinted with tannin from the forest, isn't murky with sediment. 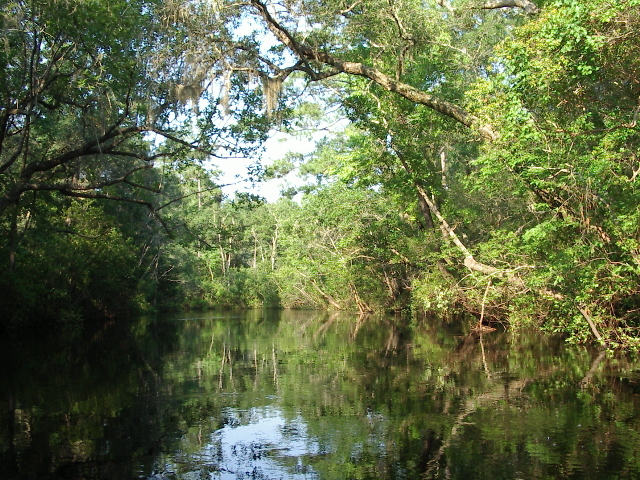 In fact this river has a sandy bottom and limestone banks filed with fossils and deeply shaded with overhanging trees with Spanish moss. I built the treehouse five years ago. First a platform tied into the trees with thick bolts and steel braces, then the walls sent a stick at a time, assembled, sided and stood up, and then the roof. The windows and door I rescued from a dumpster are a century old. The cypress siding was cut and milled a mile from the site and has already turned silver gray. I stare at the river from above and think and read and draw and write. The branches and leaves are calming at eye level and when they sway, so do I. This is a river that flows both ways, to and from the coast, changing with the tides. At one point of the day it actually has lanes with fallen leaves going up river on one side and down river on the other like slow traffic on a quiet street. The water is soft from the tannin, limestone and springs and after a swim your hair feels conditioned, shiny and soft. Some of the springs are above the river in the limestone ledges, and can be heard pouring into the dark water. There the water is clear and clean. Down river I have rigged a rope swing where the family (but mostly the boys) climb the steep bank on a set of scrap stairs and swing off and over the water, letting go with trapeze timing to splash in the cool river. Recently some local boys nailed wood to the tree for a jumping platform. One daring kid did a back flip off a high branch, dazzling all the other boys. Here it is Tarzan Camp. 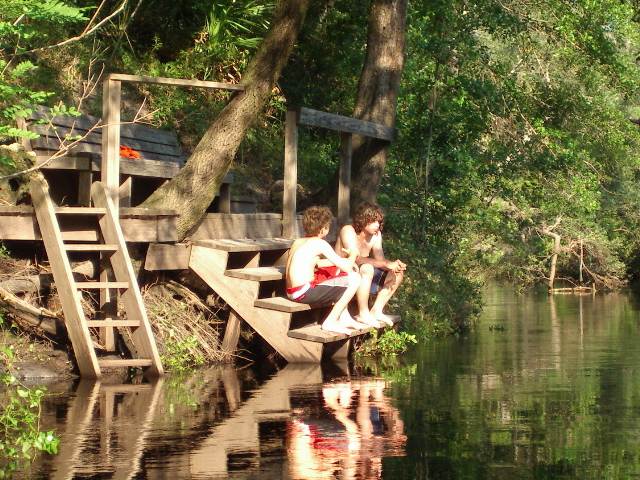 My son Luke (with the long hair) and a friend contemplate taking another swim. The dock is held to the bank with pointed wooden posts driven deep into the mat of roots and sand. There are times that the river is twenty feet higher than the water is in this picture and the dock is tormented by a swift deep current. It is built so that it is locked around the deeply rooted trees. Some nights I bathe by candlelight at the foot of the ladder. There is a deep channel about five feet from the diving stairs but at the ladder's foot there is a limestone shelf that is flat and smooth. In dry summers I have done soundings from a canoe of the river bottom with a knotted rope and weight and I am fairly familiar with the shape of the river bottom. 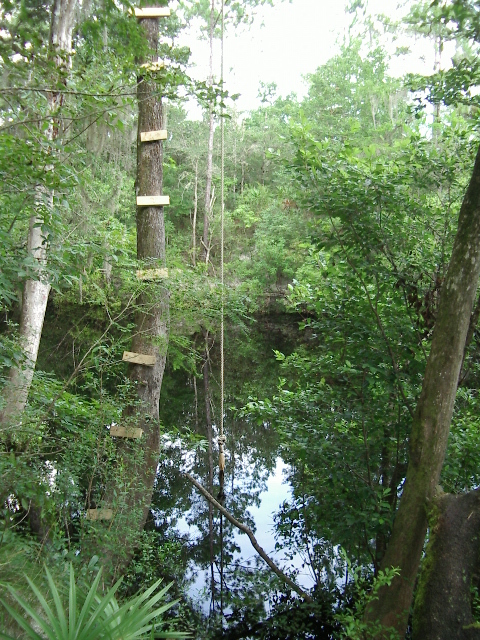 Before we go off the rope swing we'll test the waters - I will swim to the bottom and feel around with my feet. About eight feet deep the sun disappears and it is completely dark under water. Sinking feet first, looking up, watching the sun get red, then darker, and finally not there, is thrilling. I look for trees that may have floated down during a flood, any hazard that could have drifted in the swimming hole. Once we announce all clear, we hit the river. Muggy sweat turns into goose bumps in the cool water. When we built the dock we gathered limestone fragments and stones off the shelf below the river bank; one looks like the skull of a stegosaurus. For that stone, which weighs maybe 150 pounds, we rigged a rope and pulley on leaning tree and hoisted it using a sling. I use the stones we gathered to weigh the dock down so it doesn't float in flood. At the top of the hill (but eye level with the treehouse) I built a brick privy with an adjacent hot shower. 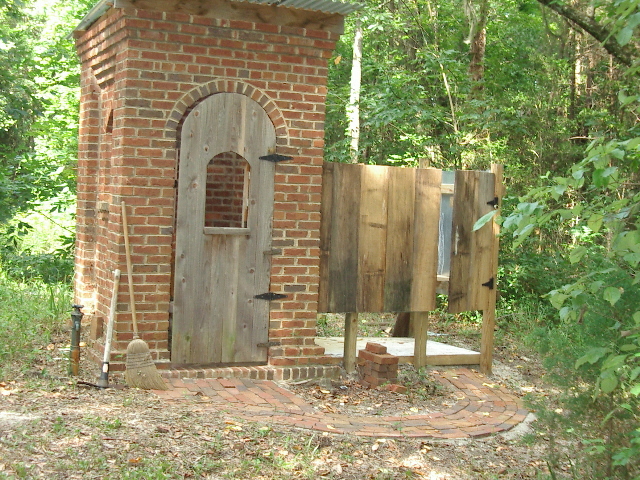 The privy is resplendent with clear roof and flushing toilet. It was built in the hottest part of the summer, temperatures well above one hundred with jungle humidity near 100%. I designed it to be much bigger at first, but then the cost was too much. The shower would have to be outside. I just recently poured the slab and put up the tin and wood partition. I love an outdoor shower. The arched openings, recessed panels and corbelled brickwork remind me of pump stations built in the WPA programs. We took five boys on this trip. The three youngest slept in the tent by the campfire where we cook. The stump beside the tent was a cherry tree damaged by a tornado. I had the 20-foot trunk cut down and milled into planks. I used the cherry wood to build a window seat and as trim inside the treehouse. 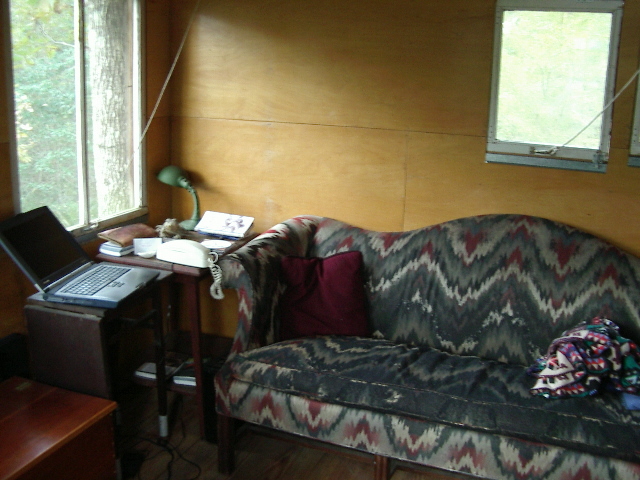 Inside the treehouse I sit on the sofa and write and stare at the river. The dangling ropes lead to pulleys on the ceiling and when the windows are all open the ropes look like a cat's cradle and the top hinged windows reflect the river below. When the wind blows the treehouse moves like a boat on the water. A view up river from the dock and the destination of most of my swims. There is a sand bar where I can stand waist deep and take a breather before I float back downstream. When the river is still, before the tide changes its direction, it's hard to tell the reflection from the trees. At night the stars are vivid in the water. The treehouse in flood as seen from the brick privy. The dark water reflects the blue sky brilliantly. I have to tie down the table and trashcans, anything in the flood's way. The river will be back down below the dock in just a few days after a flood. The headwaters of the river are the swamp and springs in the national forest and it's cleaner than most rivers. 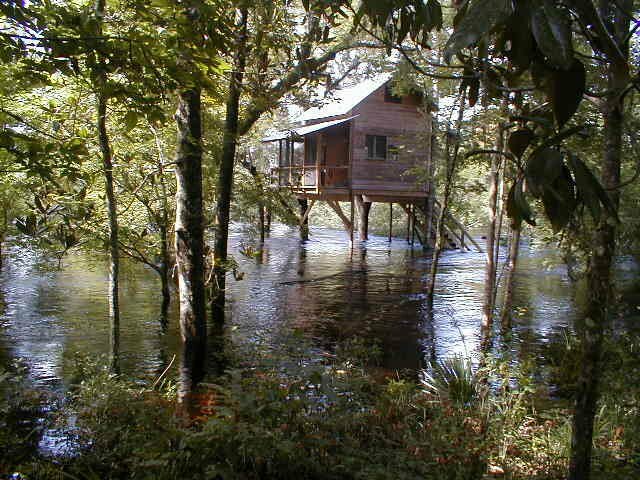 I have yet to stay in the treehouse when the river floods. Tie a john boat to the stairs, listen to the river recede. At night the frogs and crickets are deafening crying out to each other, but no sirens, trains or jets. Peaceful, primal. 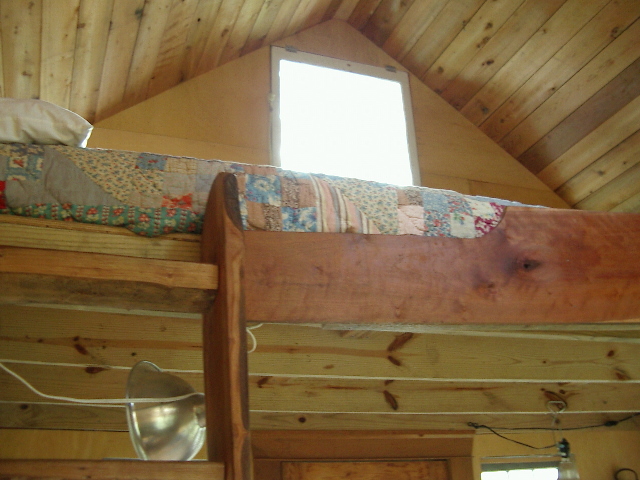 A cherrywood ladder leads to the sleeping loft with an aromatic cedar ceiling. When I look from my bed down to the river it is a height of nearly fifty feet. I sleep long and deep here, a place to catch up on my rest. 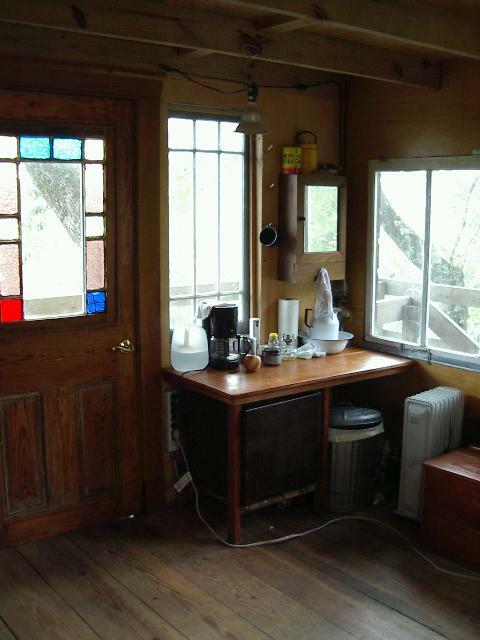 A hundred-year-old heart-pine door, a cherry counter from the tree I cut down, a tiny fridge and coffee pot make it almost like home, only much cozier. One day I'll have a sink there and outlets along the room instead of extension cords. The treehouse is small though, only 12x12, but with so many windows it feels almost as big as the view through the treetops. Across the river there is a field of pines that whisper when the wind blows. When it rains the tin roof clatters, and afterwards drops from the leaves make slow random rhythms. Sitting in the treehouse during a storm is quite a ride, lifting and shifting, Florida lightning striking all around. What a rush. I built the treehouse for family, friends and friends of friends to enjoy. It is less than 16 feet square including the porches, so it is just under code requirements for a structure and just a very elaborate deer stand, as one local suggested I call it. The well driller told me to refer to it as a fish camp. So far the inspector hasn't noticed me, but I am way up the river where he rarely goes, and maybe what I've built isn't all that important to him. It is really all I could afford to build as a vacation home, but each trip I do a project and it becomes a little more civilized. I hope to hear from the readers through Alan's web site, and maybe someone from far away will come to visit it, and nap on the sofa after a canoe ride. Phillip Raines is a retired chimney builder and writer who lives in an old house in Atlanta Georgia. Feel free to contact him through Just Above Sunset - Contact "Just Above Sunset"